Three off-road motorcycles were stolen from the Manchester Honda dealership early Tuesday morning. The theft occurred at about 12:30 a.m., police Capt. Christopher Davis said. Surveillance footage of the incident, provided by a dealership manager, shows several people backing a silver pickup truck up to the Adams Street building, shattering two windows, using bolt cutters to break a lock around the bikes’ wheels and then lifting three bikes out of the showroom. Another surveillance image show a second silver car parked across several handicap spots in the lot, with one of the suspects standing in the open driver’s side door. At least five people appeared in the surveillance footage, all of them wearing black hooded sweatshirts. The burglars were gone when police responded to the alarm, Davis said. 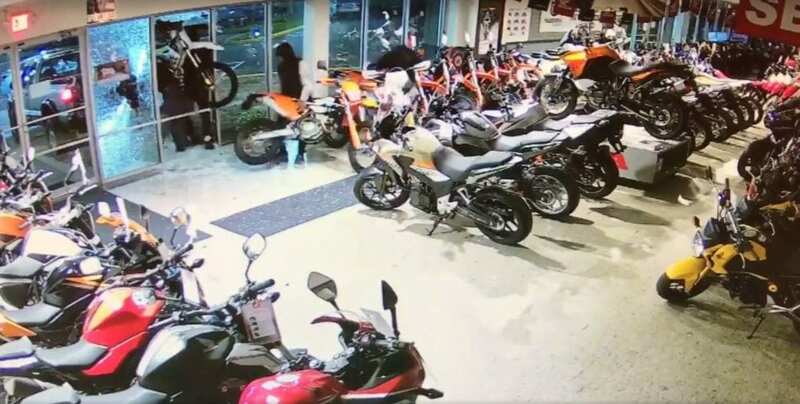 The stolen motorcycles, worth a total of about $30,000, were a white Husqvarna FC 350, an orange and black KTM 350 EXC-F, and a KTM 300 XC-W, parts manager John Adamy said. Police said they are investigating whether this incident is related to other recent burglaries and attempted burglaries of motorcycle dealerships. On May 24, two motocross motorcycles were stolen from Kaplan Cycles in the Rockville section of Vernon. The next day, state police said they arrested 18-year-old Jacian Dunnack of Willimantic while he was in possession of one of the bikes and charged him with third-degree larceny. Vernon police said the second motorcycle was returned to Kaplan Cycle but that no arrest has been made in the burglary itself. Information on other motorycle thefts was not available Tuesday from Manchester police. Adamy said he’s also aware of other dealership burglaries this year but wasn’t worried that suspects would hit Manchester Honda.